It’s October and, as usual this time of year, M&M’S has brought back its Halloween-themed No. 18 M&M’S Toyota for driver Kyle Busch during the next two Monster Energy NASCAR Cup Series races – this weekend at Kansas Speedway in Kansas City and the following weekend at Martinsville (Va.) Speedway – during one of M&M’S busiest seasons. In keeping with the Halloween theme, if one were to look at Busch’s three-race stretch at Kansas in NASCAR’s top series following the summer 2012 repave of the 1.5-mile oval, the result sheet was downright spooky for the driver of the No. 18 M&M’s Halloween Toyota Camry for Joe Gibbs Racing (JGR). Starting with the October race in 2012, Busch finished 31st, 38th, and 34th, respectively, with all three races ending in an accident. The 1.5-mile oval built in 2001, which originally featured a constant 15 degrees of banking in the turns, underwent a massive renovation project leading into the aforementioned October 2012 Cup Series event. The changes included repaving of the track surface, reconfiguration of the oval, and the addition of a new infield road course. The oval’s geometric shape also was changed to feature variable banking of 17 to 20 degrees in the turns. Feeling snakebit on the new Kansas surface after those three consecutive accidents, Busch and his M&M’S Halloween team took a different approach starting with the April 2014 race there by starting from scratch with a brand new car. They attacked the track in the Heartland of America with hope that a fresh outlook would produce vastly different results. While a pit-road speeding penalty cost them precious track position and an even better finish in the race, the result of 15th was still much different than the three previous trips. They began to turn the corner in terms of competitiveness and results. Starting with the October 2014 Kansas Cup Series race, Busch brought home his first-ever top-five finish at the track. Anyone who has ever followed Busch’s career knows the 2015 Cup Series champion never cared much for moral victories. However, the momentum carried over from the October 2014 top-five to his next Kansas race in October 2015, when he finished a solid third. It was a finish that helped vault him through to the next round of the Cup Series playoffs and eventually to the championship stage. 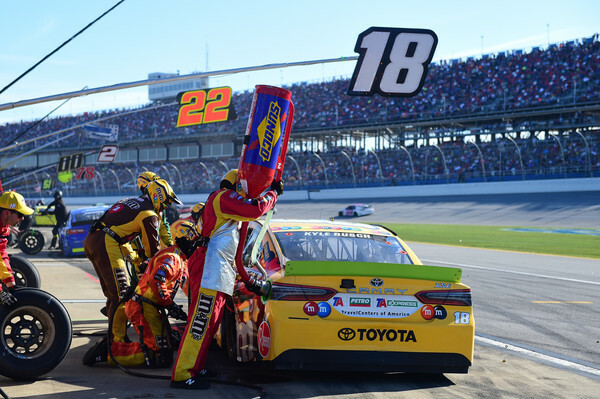 Busch has kept making strides each time he goes back to the Heartland, where he broke through for his first Cup Series win at the 1.5-mile oval in May 2016 as the surface finally started to wear and become more agreeable to Busch’s driving style as he now has seven consecutive top-10 finishes there, a streak that at one point included five consecutive top-five finishes. Sunday afternoon in Kansas, Busch and the M&M’S Halloween team will look to tackle the final race of the Round of 12 of the 2018 playoffs. Busch has a 43-point advantage over the all-important cutoff spot for the Round of 8, a gap he hopes to keep in order to make it through to the next round. The Las Vegas native hopes for two strong finishes in the first two stages, along with a solid result in Sunday’s Hollywood Casino 400 to make his advancement to the next round a formality. So, as the Cup Series heads to the Heartland of America Sunday, an eighth top-10 finish in a row at Kansas could be just what Busch needs to move on to the next playoff round. And even though Halloween is fast approaching, Kansas has been solid – not scary – for Busch and his colorful M&M’S Halloween Toyota. What difference have the bonus points for stage wins and race wins made for you so far in the playoffs? Are you looking forward to racing at Kansas more now that you’ve won there? Talk about this weekend at Kansas Speedway and your expectations on the track. How much does the racetrack at Kansas change from the night race in the spring to the day race in the fall? Kansas had been a frustrating place for you during your career, but have you and your team turned the corner there with seven top-10 finishes in a row there? The Hollywood Casino 400 will mark Kyle Busch’s 494th career Monster Energy NASCAR Cup Series start and his 22nd NASCAR Cup Series start at Kansas Speedway in Kansas City. Busch has career totals of 50 wins, 30 poles, 179 top-five finishes, 265 top-10s and 15,612 laps led in 493 career Cup Series races. His most recent Cup Series win came last month at Richmond (Va.) Raceway. Busch’s most recent pole, the 30th of his career, came on the 1.5-mile oval at Charlotte (N.C.) Motor Speedway in May. Busch has one win, five top-five finishes and nine top-10s and has led a total of 327 laps in 21 career Cup Series starts at Kansas. Busch’s average Kansas finish is 17.0. 193 and Counting: Busch enters Kansas with 193 career wins among NASCAR’s top three divisions – Cup (50), Xfinity (92) and Truck (51) – following his Cup Series win last month at Richmond.